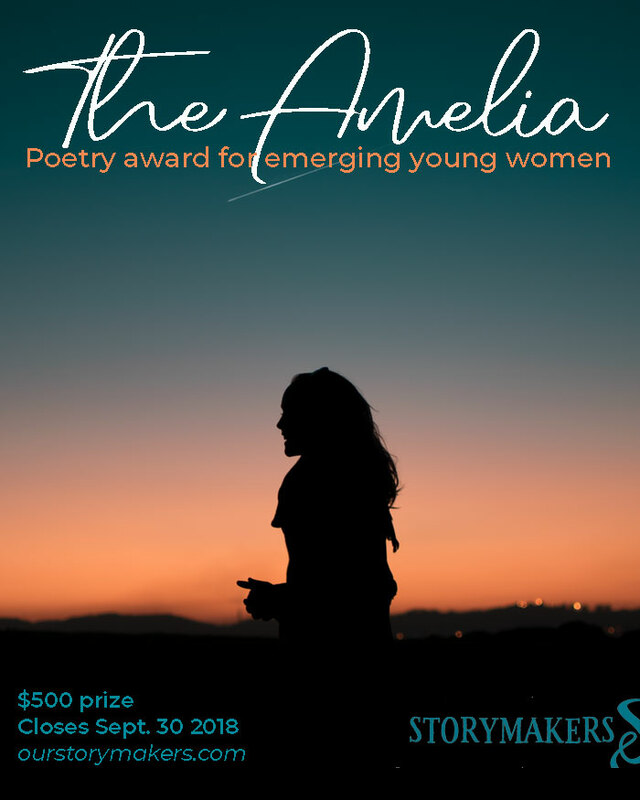 Because we love promoting, celebrating and sharing your stunning poetry, Our Storymakers is inviting young women from around the world to enter The Amelia Award for Emerging Young Women Poets!! We named our new writing award after Amelia Earhart, a woman who defied expectations of her time. You may have known that Amelia was the first woman to fly a plane solo in 1932 across the Atlantic Ocean, but did you know that she also wrote poetry? At Storymakers, we want to honor a woman who actively changed the perception of what it means to be female. She showed the world that anything is possible and we want to celebrate her feisty, inspiring spirit. So, here are the details. Read on and enter away!! The Amelia is now open and closes Sept. 30 at midnight PST. You’re an emerging poet if you haven’t published or self-published your own full-length book of poetry. You’re a young woman if you are between the ages of 16 and 29 years old, and you are or identify as a female. We are honoured and thrilled to judge the inaugural The Amelia Award! · You can enter up to three poems. · Each poem must be 60 lines or under, including line breaks between stanzas. Entries must be written in English and shared in either a Word doc or as a PDF. · To ensure judging is anonymous, please ensure your name is not included on the poetry. · The entry fee is $15 CAD (taxes included), payable online right here. · Entries must be original not published, accepted or submitted elsewhere online or in print (this includes personal blogs, social channels, etc.). This includes excerpts. Previously published or submitted poetry will be disqualified and the entry fee will not be reimbursed. · Submissions from writers who are not considered emerging will be disqualified and the entry fee will not be reimbursed. · Write about whatever subject and through whichever aesthetic you like. We can’t wait to see how you uncover your unique voice! The winner will be notified via email and only the winning entry will be announced on our website and via social media in fall 2018. The winner will also be interviewed and that interview will be shared on our website and on social media. *Remember because the judging is blind, to remove any personal information on your poetry docs! Emerging young women poets, have your writing discovered and enter for a chance to win $500! !